The Glastonbury Festival has sold 90% of tickets for this summer's event, founder Michael Eavis has said. The 137,500 tickets went on sale in October, earlier than ever, after last year failing to sell out in advance. Mr Eavis, who hosts the show on his Somerset farm, revealed he has four headliners lined up for the June event - two English and two from the US. He was speaking as he picked up an award for environmental work at the Midem music conference in France. "You'll be amazed when you hear the headliners we've got coming this year, and we've already sold 90% of the tickets for this year already," he said. "We've got four headliners at the moment. If they all confirm, then I've got two headliners for Saturday." He declined to reveal who they were because the stars have tickets on sale for their own summer shows across Europe. Bands play Glastonbury for "very little money", Mr Eavis said, so are given the chance to sell their own tickets before the festival line-up is announced. Blur, Bruce Springsteen and Neil Young have been rumoured as possible headliners. He added that he put off making a phone call to confirm a "big American act" on Monday to travel to Cannes to collect his accolade. He was honoured with the Green World Award at the Midem music conference for the festival's history of environmental fundraising and ecological initiatives. The festival raises money for Greenpeace, Oxfam and Water Aid, while Mr Eavis' other green measures include recycling food waste on the working dairy farm, meaning he has not needed to use chemical fertilisers for almost 40 years. The event also recycles 1,000 tonnes of rubbish a year, has introduced biodegradable tent pegs and sent seven tonnes of abandoned Wellington boots to be used in Senegal. "And they used every single one of them," Mr Eavis said. He started the festival on his land in 1970, when Marc Bolan and T-Rex were the top attraction. 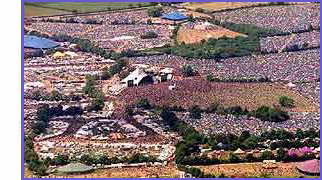 "Right at the very beginning, some of the hippies turned up," Mr Eavis said. "They were fairly unsightly, but do you know what, they were spot on with the green message."